Delievery before Christmas possible—–Lieferung vor Weihnachten! 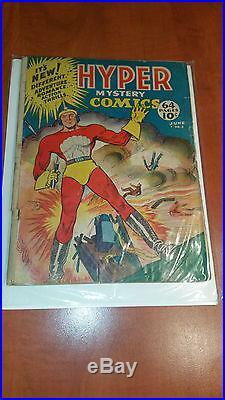 Hyper Mystery Comics – #2 (1940) -Very rare Golden Age! For your private Comics-Library! First, Im not a comic. As you can see on my feedback I deal with very old books and manucripts. As you can see on my feedbacks Im a very honest dealer. Here will be no hidden flaws. I will make photos of all problems! 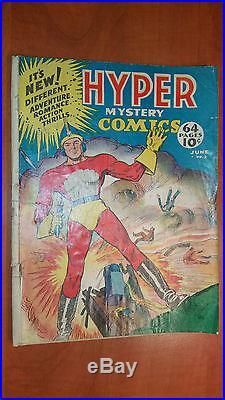 Here now the details of the following item: Name: In our last chapter Don-Vin “the Hyper” was left… Volume: Hyper Mystery Comics Issue: Number 2 Date: June, 1940 The series ran for 2 issues from May 1940 – June 1940. Condition: I can see four major problems with this comic. Not flat, uneven, spine and front and back cover with little tears 2. Writings on front and back cover, otherwise minor staining 3. Here and there some tears (see photots), last page with longer tear (see photo) 4. Browned, One stitch torn out from cover. This comic book is extremely rare and complete! 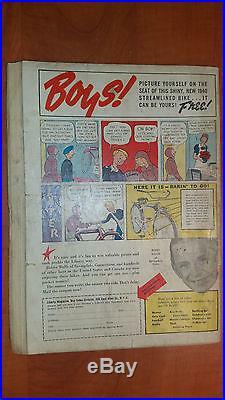 Keywords: sehr altes buch, very old and rare book, comic, american, usa, silver age. The item is located in Germany! The item “Hyper Mystery Comics #2 (1940) -Very rare Golden Age” is in sale since Thursday, December 08, 2016. This item is in the category “Collectibles\Comics\Golden Age (1938-55)\Other Golden Age Comics”. The seller is “eckhardebuy” and is located in Kleinmachnow. This item can be shipped worldwide. hyper comics, golden, hyper, mystery, rare, very. permalink.